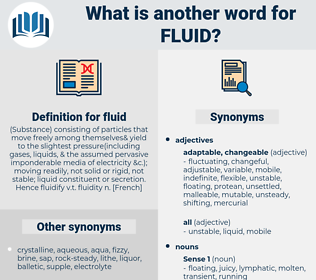 What is another word for fluid? fluctuating, flexible, flowing, bodily, variable, indecisive, leakage, adaptable, changing, accepted, blurry. 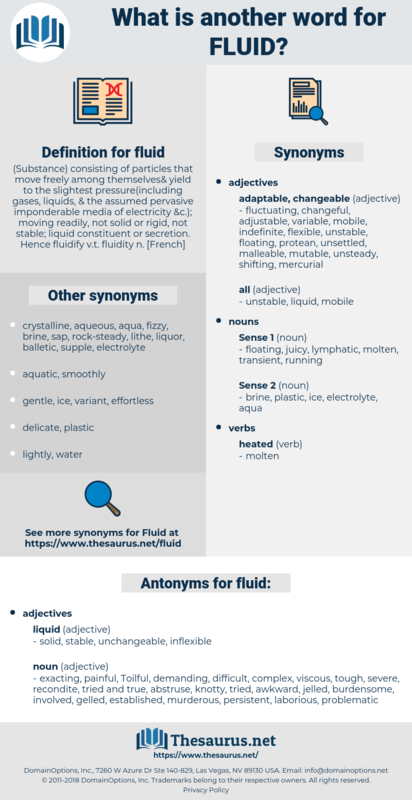 free-flowing, smooth, unstable, volatile, uncertain, hydraulic, changeable, liquids, precarious. even, oppressive, herculean, murderous, severe, intricate, coagulated, trustworthy, demanding, glutinous, lasting, knotty, recondite, dependable, tried and true, gluey, onerous, taxing, complex, labored, ramrod, problematic, gelled, predictable, involved, inelastic, nondisposable, abstruse, established, jelled, exacting, laborious, exhausting, gummy, unadaptable, tough, reliable, equable, rough, toilsome, stressful, permanent, uniform, immutable, viscous, awkward, burdensome, grueling, trusty, jellied, difficult, unalterable, Toilful, sure, clotted, arduous, tried, troublesome, gooey, gelatinous, formidable, true, persistent, complicated, invariable, durable, strenuous, abiding, stiff, painful. It will be noticed that the fluid connection is nearest the nozzle and that the air connection is at the bottom of the grip. Noiselessly, by the multiform orders of monks and nuns, as through so many veins and arteries, it sends out and receives back its vital fluid. filtrate, liquid, ichor, gas, coolant.